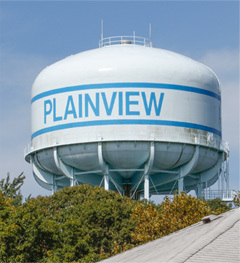 Plainview Water District provides our consumers with a safe, high-quality and bountiful supply of public drinking water. We are committed to achieving environmental excellence and providing unparalleled service while maintaining reasonable rates that are some of the lowest in the country. We place a high priority on proactively maintaining the District’s infrastructure. Plainview Water District was established in 1928 when it became a special improvement district in the Town of Oyster Bay, encompassing all of Plainview and portions of Old Bethpage and Syosset. Until 1953, all water consumed was purchased from a neighboring district. There were no wells, tanks, administration or maintenance buildings, just a limited number of water mains. Development of Plainview Water District progressed in 1953 to its current status of an efficiently operated water district with 12 wells, one 2-million-gallon ground tank, two 1.5-million-gallon ground tanks and one 1.25-million-gallon elevated tank. Potable water is furnished to more than 10,500 accounts through approximately 130 miles of water main serving approximately 32,000 residents. 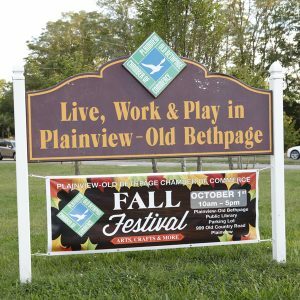 We have provided nearly 90 years of dedicated service to the communities of Plainview, Old Bethpage and Syosset.